It is a theory of how the self interest of each person in a nation guides supply and demand in a nation’s economy toward a workable (or even ideal) division of labor, wages, resources, wealth, etc via a moral incentive inherent in the human condition (Smith’s “theory of moral sentiments” applied to the economics behind the wealth of nations“). Another way to say it is that Adam Smith’s economic and moral theories postulate that an economy works best with a free-market where everyone works for their own interest. In fact, Smith postulates that this is perhaps the best natural way, and even better than if the state or nature herself had used a more visible hand. So then, to Smith, the invisible hand is used as a metaphor for how self interest and shared interest drives a free-market! Or, as wikipedia puts it, “a term used by Adam Smith to describe the unintended social benefits of individual actions”. In short, Smith is making an argument for free-market capitalism. Or at least, that is how it applies to economics. If we take the term and apply it to moral philosophy and social philosophy (Smith did this as well in his Theory of Moral Sentiments), the term then becomes a way to speak about how our natural moral sentiments (like the desire to feel appreciated) guide our social relationships and lives (as if by the hand of God). Thus, all his works considered, the invisible hand metaphor is part of a moral theory sans the spirituality and theology, applied to social dynamics and market dynamics. This makes sense for Smith the liberal empiricist in the age of Reason. No matter how we describe the invisible hand, the concept is the same and is arguably the main theme of Smith’s works: self interest + free-will of the many = better than having everything planned by the state; a classical social and economic theory put forth by the liberal father of modern [classical liberal / neoclassical] economics Adam Smith. “By preferring the support of domestic to that of foreign industry, he intends only his own security; and by directing that industry in such a manner as its produce may be of the greatest value, he intends only his own gain, and he is in this, as in many other cases, led by an invisible hand to promote an end which was no part of his intention. Nor is it always the worse for the society that it was not part of it. By pursuing his own interest he frequently promotes that of the society more effectually than when he really intends to promote it.” – Wealth of Nations, Book I, Chapter 7. Here the theory of Moral Sentiments is applied to economics. TIP: You can do a command find on the Theory of Moral Sentiments and the Wealth of Nations to find all the quotes with the term “invisible hand” in it. Smith uses it more than once in different contexts. The Invisible Hand – 60 Second Adventures in Economics (1/6). TIP: An “invisible” or “shadow” anything is analogous to Smith’s concept. It either means “hidden” or “spaces in between.” For instance, an invisible government is the mostly unintended social consequences of individual self-interest in politics. It is special interest creating a shadow government. The terms are all related, but the term “invisible hand” is specifically Smith’s concept. TIP: The invisible hand invokes the idea of God, but it is not a reference to God. It is more just Smith musing on the effects of his favorite theory, his moral theory, his Theory of Moral Sentiments. Smith only uses the phrase “invisible hand” a few times in his work, the concept sticks because it generally describes his work and sounds cool, not because the metaphor was used by Smith frequently. To a Classical Liberal Economist Like Smith, “It’s Not from the Benevolence of the Butcher that We Expect our Dinner”… it is “From their Regard to their own self Interest”. This quote is at the heart of Smith’s Wealth of Nations, classical liberalism, classical liberal economics, free-trade, capitalism, and general free-market ideology. Not just that, but it is at the heart of Smith’s Theory of Moral Sentiments (and even some of his earlier works). The quote is important to these economically liberal ideologies, as it expresses the idea that free-markets can work without any state intervention. For Smith, the butcher doesn’t sell meat because of some altruistic moral desire to see people fed, instead he sells meat to amass capital rather than a pile of rotting meat. This moral sentiment is of a very empirical and practical nature, it is not a thing of pure reason. Simply put, the theory says: For better or worse, self interest drives the free-market and thus a visible hand (like the hand of a King or the state) is not needed. Thus, it is a favorite of the economically liberal free-market economist. Of course, as we all know, sometimes a fully free market doesn’t seem very fair in practice. And in fact, social liberalism, an evolution of classical liberalism, is all about addressing that sticking point. Modern economics (a synthesis of Smith and later economists like Keynes) is often focused on curbing “the worse” the invisible hand offers and extenuating “the best”… without mucking up the core principles related to moral sentiment and liberalization. 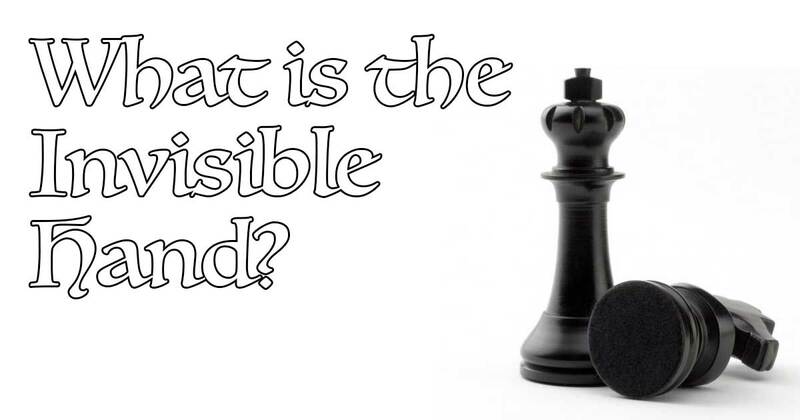 Ultimately some will argue state control is best, some will argue for the invisible hand only, and some will try to play alchemist and make a mix… but what works best is really is an aside here, the point of this page is to look at the concept of the invisible hand and how it applies to economic systems. Below we look at Smith’s invisible hand and how this relates to historic and modern political and economic ideologies. There is no perfect way to understand Smith’s invisible hand and the importance of his economic and moral theories, but this page should help you get the gist. TIP: Smith’s two big theories were his economic theory in Wealth of Nations and his moral theory in Theory of Moral sentiments. The concept of an “invisible hand” is a concept that sums up both theories. Thus, it isn’t so easily explained, hence the long page. See the videos for other perspectives. To understand the above concept of the invisible hand, it helps to make a distinction between the way things used to be, the democratic free-market capitalism Smith preached, and our modern mixed-system (which has “visible hands” in it). Traditional conservative “state planned” economy and (the old way). A style of economy based on the idea that Kings and Churches should control the economy of a nation. They didn’t always intervene in practice, as in reality the royalty didn’t always oversee and dictate every form of trade. However, to our point, the concept here is that it is a form of economy based on the idea that socioeconomic systems need to be controlled. This led to a type of economic system called mercantilism (which is sort of like a ye old version of crony capitalism with state backed monopolies and high taxes). Smith criticized mercantilism and thought that a nation would be even more successful if the government got out of the way and didn’t try to micromanage or play favorites. This is visible hand economics. Classic liberal “neoclassical” economics (Smith’s style free-market capitalism). A form of economy that is rooted in free markets. It warns against state intervention and says, “the invisible hand of the free-market will result in resources being divvied up as if nature had done it herself.” This is classical liberal economics (the economics of the invisible hand so to speak). Modern social-liberal “mixed-market” economics (the modern western way, a Mixed-System). Later economic theories and ideologies evolved and mixed up Smith’s form and the traditional form to branch of in a number of directions. Many mixes, for example Keynesian economics and neoliberalism, suggest a more visible hand is sometimes needed to guide the free market. Other forms, for example the Austrian school’s form of neoclassical economics, suggest that we should be staying true to a very specific reading of Smith (one where we focus on the free market, and not his more liberal and progressive character). There is also mashups of these schools, for example, new neo-classical synthesis. In short, the old system gave way to a new system, and then those two systems were synthesized to create may more theories of how the economy should work. Smith’s work represents a turning point. Meanwhile, the famous invisible hand concept represents a major concept behind that turning point. Below we explore Adam Smith the father of classic liberal economics and his concept of the invisible hand further. The concept of the invisible hand is that an economy doesn’t need to be guided by aristocrats and monarchs. Rather, “moral sentiment” will guide human behavior and thus the economy. It will lead to the Wealth of Nations, which is wealth best measured by metrics like commerce and trade, rather stockpiles of gold. Some act for the common benefit, some only help others for gain, but regardless of individual intentions, Smith believed the net effect of people’s actions would result in social benefit. He believed that the result would resemble the way in which goods would be shared had a benevolent mother nature distributed goods and services herself. One doesn’t have to force the baker to sell his bread or buy meat from the butcher; the baker and butcher decide to trade their wares for capital rather than sitting on stocks of spoiling food. The rest is handled by charity. Smith believed that even the worst of men were empathic and derived pleasure from causing happiness in those around them however small an individual’s social circle. The idea that self-interest could safeguard an economy may seem naive, but Smith’s books are filled with warnings of pitfalls which add the needed layer of complexity. He spends most of his pages pondering how to offset the greed of “masters” while reminding us of morality and ethics. Adam Smith, Theory of Moral Sentiments. Smith described a system of free-market capitalism in The Wealth of Nations, but the morality found in The Theory of Moral Sentiments plays a prominent role in his philosophies. Smith’s message centers around the reoccurring image of the “the invisible hand.” Although he only mentions it a few times, it has come to represent his overarching moral-economic-political philosophy. Smith believed, that in a just society with a system of ethics and law, moral self-interest and self-interested competition in the free market would tend to benefit society as a whole. He believed that it would keep prices low, while still incentivizing a wide variety of goods and services. It would be messy in regards to worker rights, factions, and monopolies, but despite the dangers, self-interest would ultimately create a steady economy of price and quantity as a net effect especially over time as nations accumulated wealth for the people. The concept that a nation and its economy can be guided toward a social good, without state intervention, almost as if by divine force, can be described as “the invisible hand.” This means that there is a nod to divinity here, but like the hand itself, it is a metaphor of sorts. Although he uses the term in a few different ways, the following passage from Theory of Moral Sentiment Page 99 does a good job of summing it up in Smith’s words. Given this, Smith can be said to have laid the ideology for what we would today call “free-market capitalism.” Or more accurately, if you read his work, ethically focused, regulated, free-market capitalism. It is important to note this point, as Smith’s theories are the foundation on which modern capitalism is formed and sometimes deformed. Consider Smith was friends with America’s founding father Franklin and was a very influential figure at the time. The fabricated myth of the invisible hand. TIP: Aspects of Smith’s system are contingent upon nationalism and spending vs. hoarding. The underlying concept is that one wouldn’t send more capital outside of one’s nation than one would keep domestically out of self-interest, and thus would recycle capital back into one’s own nation. Further, there is this idea that the butcher is compelled to trade his meat, but one can argue that not everything is quick to spoil. Smith suggested lifting regulations, but also warned against potential pitfalls. One can argue whether Smith’s theory works in action today, and whether it incentivizes a nation outside of nations comprised of the elite “mercantile class” whose primary driver is still money and moral sentiment, but not nationalism. Arguments for and against the theory, or a state run purely by an invisible hand are a subject for another day. « Is America an Oligarchy?